It is not troublesome for the tourist to spot the simple and plentiful scenic beauty. The lakes and waterfalls of Uttarakhand are tucked away in the ranges of the Himalayas. The waterfalls in Uttarakhand cascade down into great depths and the lakes of Uttarakhand provide the tourists with mirror images of the beautiful surroundings. These lakes and waterfalls endow Uttarakhand with an exclusive beauty. The Kempty Waterfalls in Uttarakhand is situated at a distance of fifteen kilometers from Mussoorie. The water of the Kempty Waterfalls in Uttarakhand gushes down from a height of 4,500 feet. As the torrent of water of the Kempty Waterfalls comes pouring down and flows above the rock-strewn territory, the water splits into five separate streams. This offers a picture-perfect view to the tourers. 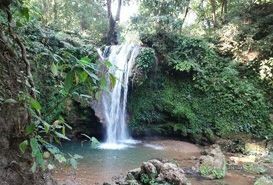 The nearby places surrounding the Kempty Waterfalls in Uttarakhand are extremely commercialized and they offer every necessary thing to the tourists. These commercial zones supply everything, right from the swimming tyres to many good eateries.